Richmond's Kane Lambert was a strong contributor for the Tigers' VFL side on his return from a shoulder injury. Richmond’s VFL team was left ruing missed opportunities in its two-point loss to Footscray on Saturday at the ME Centre. The Tigers dominated play early and could have taken substantial leads at various stages, but inefficiency plagued the Tigers, and they struggled to establish much of a buffer. The lead changed hands frequently throughout, with the winning margin resulting from two rushed behinds to the Bulldogs in the dying minutes. In a game of great intensity, Jaryd Cachia continued his influential form. He gathered 38 possessions (21 contested), 13 clearances and applied intense pressure on Footscray’s midfielders. Matt McDonough also shone around the contest with 28 disposals and five clearances. He also managed to push forward to kick three goals. VFL coach Tim Clarke said a lack of ball control at various times played a critical role in the team’s loss. “If you can’t control the footy, the other team doesn’t have to defend. We felt today that their (Footscray’s) ability to transition off turnovers was very good and it put our backs under pressure,” he said. But Clarke was quick to reinforce the improvement in the team’s intensity and attack on the football. “Last time when we played against Werribee we weren’t competitive. We were terrible through the midfield but today our boys competed really well,” he said. Two players who attracted the praise of their coach were Matt Dea, who provided excellent run off the halfback line, and Sam Lloyd, who kicked two goals and was impactful in the forward line. “Dea has been pushing for senior selection for about eight weeks. He keeps fighting and doing the right thing at VFL so we know when the time comes, when an opportunity opens up, he’s ready to take it,” he said. 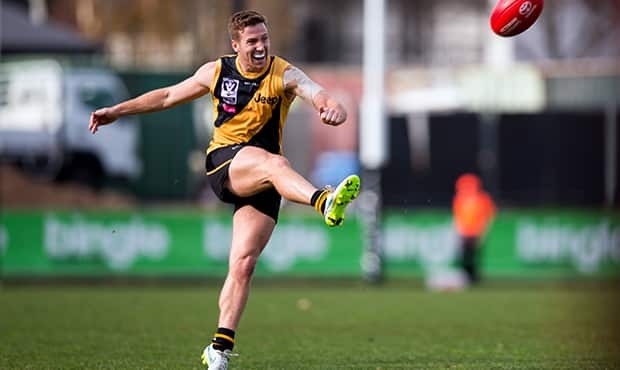 Another highlight for the Tigers was the long-awaited return of Kane Lambert, who injured his shoulder in Round 2 of the AFL. After coming on during the second quarter, Lambert dominated both in around the contest, collecting 28 disposals, eight clearances and kicking a goal. The Tigers will look to bounce back next Saturday when they meet Williamstown at the ME Centre.